The reward of sticking with your favorite local acts as they find their voice is both thrilling and challenging. 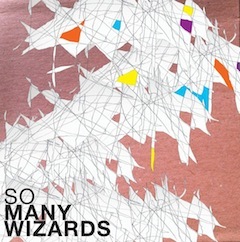 Being so, I’m happy to say Los Angeles’s So Many Wizards have continued to craft their sound, perfecting their enigmatic blend of pop, rock, ballads and zany nuggets into a cohesive whole. While the entirety of their brief body of work has been enjoyable, on their new 7”, the maturity and honed sound is evident. As a vocalist, Nima Kazerouni has grown completely comfortable in his voice, seamlessly moving from falsetto into the bands ever-improving song structure and arrangements. Drummer Erik Felix pounds away while bassist Warren Woodward oo’s and aa’s to form the bands unique melodies; it’s not that we’ve been waiting for So Many Wizards to put out songs this good. Rather, it is that patience has been rewarded with their best songs yet. wow, this song is amazing.